A headband is useful to keep your hair out of the way. Put the syrup in a plastic container and heat 10-13 seconds in the microwave. 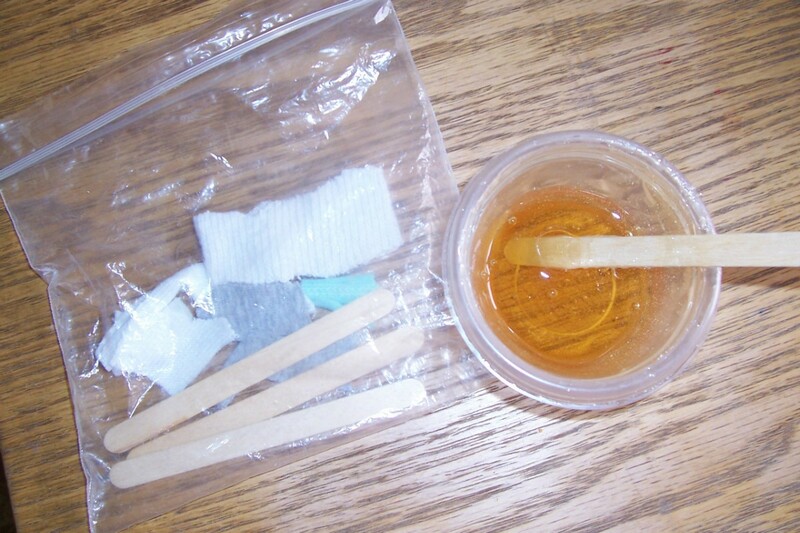 Stir with a stick and test temperature on the back of your hand. If it's too hot, stir until it cools off. Hold skin taut and quickly pull against the hair growth direction. Wipe area with a cool wash cloth and go to the next brow. Use as you would any hot wax on eye brows, lip area, leg or wherever you choose. Do not use more than twice on the same area per session to avoid soreness. The trick to less pain is holding the skin taut! 2 oz. will last a year if you only use it on brows. P. S. This can also be used to exfoliate your face by just evenly applying it and then wiping it off with a damp cloth. Picks up all those dead skin cells.